He was the offspring of a Corfiot artists’ family, the grandson of the sculptor Pavlos Prossalentis Senior and the son of the painter SpyridonProssalentis. He studied engineering in Paris. In 1874 he returned to Greece and served as an officer in the navy. From the mid-1880s heparticipated in group art exhibitions. He was interested in landscape painting – especially in seascapes – and historical scenes and figures. 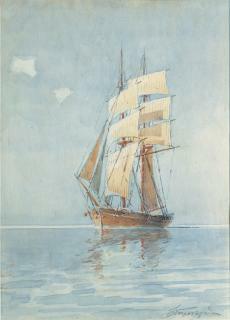 He made a substantial contributionto establishing the tradition of watercolour painting in the Ionian Islands.